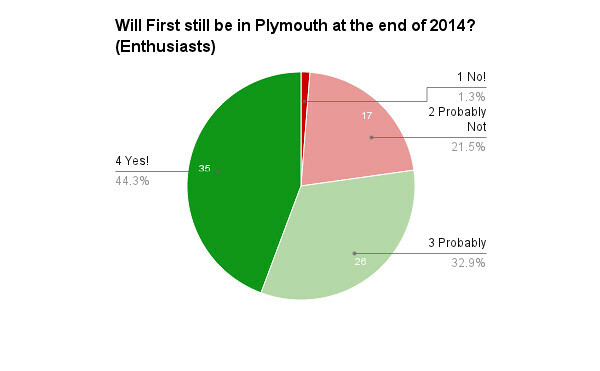 Will First still be in Plymouth at the end of 2014? We had 144 answers to this question which is a great response, more than I expected. You will see that three quarters of you felt that First would probably be around and of the negative answers only 4 of you were certain they wouldn't be. From this very unscientific study it appears the professionals are slightly more pessimistic on this question than enthusiasts! Again though the majority do expect then to stay around. So we get on to part 2 of this question which asked those who thought First probably would not be around – why not? Bear in mind that this graph represents just the 38 people that thought First would probably not be around at the end of 2014. Almost three quarters feeling the business would just close down. In this case the results are pretty similar for enthusiasts and professional staff. Finally – I am happy to confirm that the winner of the £20 Amazon Voucher was Patrick Newcombe. The voucher should be with you by now! Wonder what the £4m loss by FDC will mean for future plans for the company in the region.Further Cornwall Council budget cuts to come in April could be crucial. This all just when a big order for 100's of new buses is announced, but will any of them reach Devon & Cornwall or will First just "pull out" altogether later in the year? If they do would anyone be willing to take over and trying to turn services round and make them profitable, I can't see Stagecoach wanting to take over Cornwall from First however they might like to have a go in Plymouth. I honestly dont think Stagecoach will be wanting to buy out First, however the depot would be a great idea for the megabus operations for the southwest. As a rule 'enthuiasts' probably only see what the operators want them to see, whereas 'professional staff have a insiders perspective. A loss of £4m won't make a difference, First will bale it out from the other companies profits across the country - so the parent holding company has the funds to allow FDC to continue to trade. They've been losing money since 2003, so this will really make no difference. Remember, Citybus have taken a big risk with their expansion and they've got to meet their targets in order to contribute to the group wide requirement to make a £100m profit by 2015. Anon 20:49 Totally agree, First would have pulled out over the last 10 years if they wanted too. Also remember the last years accounts are before they started the recovery plan.. They have withdrawn a lot of unprofitable routes in Devon and are making a real go of increasing their routes and customer base in Plymouth. PCB have taken a huge risk with their expansion and from what I see I would not say they are picking up enough customers on Blue Flash and even more so in Torpoint to cover the huge outlay and contribute to The £100m profit needed.. They could even end up making a loss, First might just think it is worth sitting this one out whilst Citybus/GA inflict damage on themselves, then who knows? With the new bus order that will free up more rolling stock to be added to Plymouth should they feel the need or demand for their much cheaper services elsewhere in the city! Citybus with the demanding HQ and shareholders cannot afford long term price cuts, First having made a loss for 10 years here, might feel another couple won;t hurt.. First have nothing to lose and much to gain..opposite from PCB. Okay, last year's figures may pre-date the recovery plan but by the same token, they will include 100% of the available revenue from the Tavistock and Torpoint services, which is no longer the case. Less revenue but still similar overheads on those routes now (or even greater overheads on Tavistocks allowing for depreciation of the nearly new deckers they're now using). Ouch! You can't tell me that isn't going to hurt. The problem with wild speculation is that it is deeply upsetting for the staff who eventually worry about these rumours. When First changed its regional structure and divided it up, South West was created out of Taunton and Bridgwater, Cornwall and Plymouth. 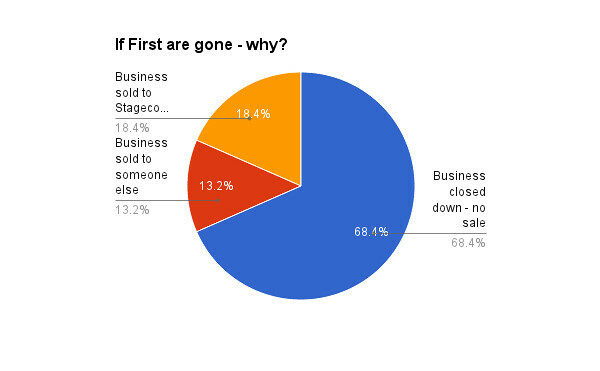 A the time First said that south Devon was close to shut down, but it hasn't happened,so it does look like Go Ahead's attempt to muscle themselves into a monopoly position in Plymouth may have had the opposite effect. In truth a very small number of people within even First must know what the Plymouth plan is. Maybe speculation about Plymouth is therefore inevitable. Talking about First leaving Cornwall is completely unfounded though, and unsubstantiated by anyone or any actions. First have a plan for Cornwall and the recent fare changes are the first evidence that they are underway after a period of sorting things behind the scenes. Those in the know are upbeat about Cornwall, and not bothered about Cornwall CC tenders, which have been loss making since last won. Lets stop this wild speculation about Cornwall and see what happens over the next few months. Taunton and Bridgwater is the same. Lots of talk about a sale because they've been painting buses green instead of in First colours. Now it's general knowledge within the staff at those depots that First have let Alex Carter and his new team tear up the First bus corporate rule book and create something completely new. Next weekend is the date when things are due to happen in the Somerset that should show just how much is changing and just how serious First are about Somerset and Cornwall. Wait a week or so and we can all see what's been going on behind the scenes. A lot of people are going to be surprised just how much work has already been done to turn First around in the South West. I really do wonder what planet some people are living on! - First in Cornwall has just announced plans to deal with CCC cuts and return the operation to profitability, hence the new £2 minimum fare already discussed on this board. - Why would anyone else want to pick-up First's Plymouth business? It's mess. Stagecoach won't be interested, after all they've already said they looked at buying it and walked away. If First can't make Plymouth work, it'll be close-down time. - First ought to be able to turn Cornwall around, not so sure about Plymouth. Besides, they've never said that Cornwall was up for grabs - it was never even on the infamous list of disposals and it should be a lot easier to fix than Plymouth. - As for using The Ride as a Megabus depot.... what? All Megabus workings are scheduled to run down and go straight back up country and the coaches are diagrammed back to Rugby (or Cwmbran) for maintenace. Why would they want a large depot in Pymouth, miles away from the bulk of the network??? - In any event, The Ride is likely to be compulsorily purchased and redeveloped in the next few years - probably another key reason why First couldn't sell the Plymouth operation. Who would want all that extra hassle and disruption on top of trying to fix a large loss-making operation? - I see Anon 20:49 is still applying different rules to First and Go-Ahead. If FDC has been making a loss for 11 years and it's now up to £4m a year, why is First still sticking with it? They're in business to make money, so what is the point in spending £4m a year just to keep it going? It's nonsensical; utter madness They've had too many attempts now to fix it - Plymouth at least. Cornwall is a different matter and should be saveable but if Plymouth is losing say 75% of the £4m, that's over £8000 every day. Every day. That's horrendous. Cornwall has been contributing to that loss, but is reportedly already stabilised and ready for a revolution like Somerset is about to get.